Emergency Medical Education and Resource Group, Inc. (EMERG) began in 2011 when it became apparent that the DFW area was in need of a new program. Many programs in the area have lengthy wait lists or low pass rates. At EMERG, we feel that the number one priority is providing our students with a quality education. If that means we limit the number of students we accept and have longer courses, then so be it. We want our students to be successful. In fact, in our EMT Program, we guarantee it! We are so confident in our program, we guarantee that if you pass the class, you will pass the National Registry exam. If you fail your first attempt, we will offer you whatever remediation is needed at no cost to you to ensure you succeed. Rich has been working and volunteering in the field of Fire/EMS since 1988 when he started as a volunteer firefighter in New Jersey. Rich went on to receive his EMT certification in 1992 and was a Captain with Kissimmee Heights Volunteer Fire Department. Rich received his paramedic license in 2000, graduating in the top of his class. Though he spent many years providing care in the field, he quickly found his niche in education and became the lead instructor in an initial EMT and continuing education program at Grundy County Ambulance in Missouri. His success in Grundy County led him to Overland Park Fire Department in Kansas where he was quickly promoted from firefighter/paramedic to the position of Training Officer/Captain. During his five years with OPFD, he taught more than 100 ACLS, BLS, PALS and PHTLS courses to EMS providers, nurses, physicians and lay public and became a regional faculty member for ACLS and PHTLS. In November of 2007, he began his employment with Biocare, which held numerous EMT and Paramedic program, all with higher pass rates during Rich’s tenure. Rich has worked in various field capacities, urgent care settings and EMS Director positions. EMERG currently operates 2 ambulance services and other Medical First Aid and Fire Suppression events. Sarah became an EMT in 1997 and a paramedic in 2002. She has worked in a variety of EMS settings including amusement parks in Ohio, Missouri and Texas, primary 911 response in Knox County, Tennessee, volunteer EMS in rural Missouri and an Emergency Department at a Level 2 trauma center in Dallas where she served as a clinical preceptor for EMT and paramedic students. Sarah also has an extensive background in teaching, emergency planning, special events and emergency management. She played substantial roles in emergency planning for the 2010 and 2011 World Series, Super Bowl XLV and more than 400 other special events in Texas. Sarah holds a Master’s degree in Emergency Management. Dr. Lynn Brown graduated from Texas A&M University in 1986 and later graduated from Texas Tech University Health Sciences Center in 1993. He completed his Emergency Medicine residency at Michigan State University Sparrow Hospital in 1996. Dr. Brown brings a wealth of clinical experience from years of emergency medicine practice in Kansas City and most recently Spokane, Washington. 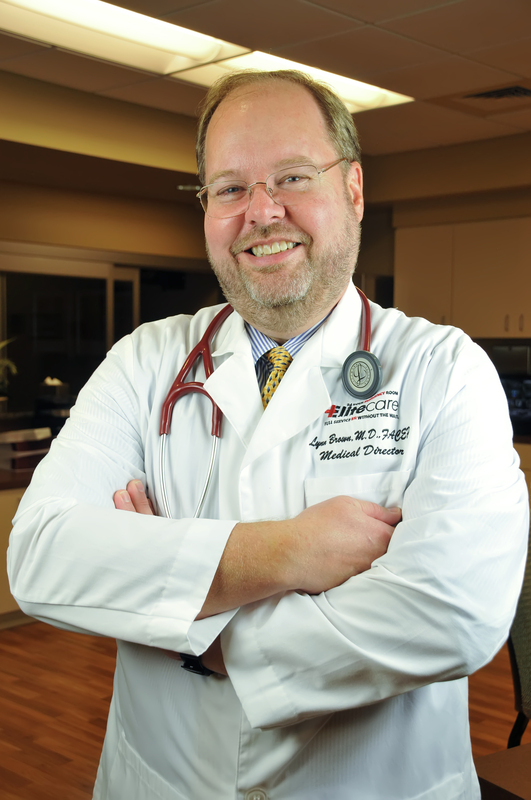 In addition to working in high volume facilities with significant critical care experience, he has served as the hospital Medical Staff President, Director of Emergency Services, Medical Director for Overland Park Fire Department, and President of a large private Emergency Medicine physician group. Steve joined the US Marines in 1988 and spent 5 years on active duty obtaining a Top Secret security clearance while working at the Pentagon. He departed the Marines in 1994 and transitioned to corporate America where he became the Health and Safety Officer for a Fortune 500 semiconductor design firm. In 2006 he joined his local fire department and realized his passion for EMS. He became an EMT in 2009, graduating at the top of his class. He began working with EMERG in 2012 and acquired his EMS and BLS Instructor licenses in 2013. Ashlee has been an EMT working on an ambulance for EMERG since 2015. She began doing some administrative work for us part-time and has since taken over the full time position administrative assistant role. She has recently completed her BLS instructor certification and will be teaching classes at our new facility.